The FreedomPop Diagnostic App was designed to be a companion when resolving any issues with our tech support during call or via email. 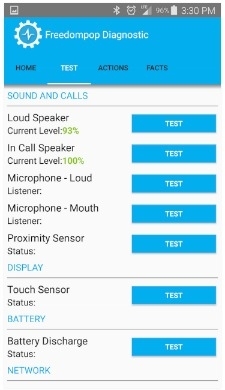 Not only does this app allow you to test sounds/calls, display, battery and network but you can also take other actions! 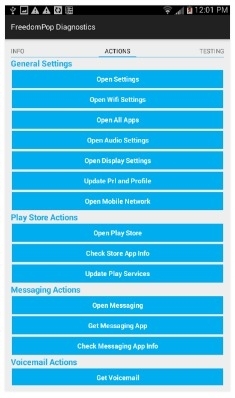 Note: This app is only compatible with android devices (4.0.3 and up). You can download our app. This app is really cool and useful, but unfortunately it didn't fix my network data problem. It says my device is incompatible for a soft or hard reset. 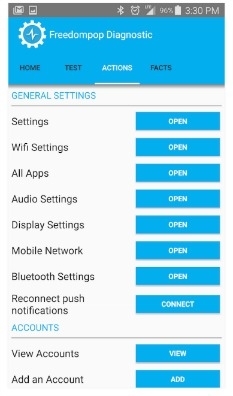 I've tried all the other options I've found on the forums, but still the number only works when I'm connected to wifi. I just wonder if anyone else can help. Thank you! Would this help with BYOD CDMA problems? I really think my sim wasn't registered at activated but no rep with refresh my account to see if that's what is the problem. They keep saying it's because the messaging app is not installed, but I don't see how that's necessary for a cellular data cellular. Doesn't matter anyway because that's not the problem because I've had it installed and still no internet connection, no 3G/4G symbols just those bars show. I have installed the latest version of diagnostic app, but every time I start it it says "Unfortunately, FreedomPop Diagnostic has stopped." Tried the diagnostic app before but its very basic in terms of suggesting that everything is / will work OK. It does no real call / connection testing. It does actually perform a connection test to determine your chances of things working a lot better. E.g. when I use it at a location where the Freedompop Wifi calling doesn't work it tells me that the NAT (or firewall in this case) system is completely blocked and it can't get to the server. At locations where it does work it states the NAT type and success at testing a connection. And that is just a basic tool, which doesn't even try the voice / RTSP part of the process. Long story short, the diagnostics could be much more deeper. 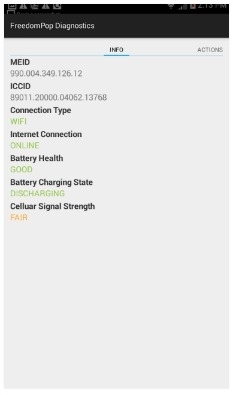 "Unfortunately, FreedomPop Diagnostic has stopped." So I can get incoming calls while on LTE or 3G but NOT while on WiFi alone. I CAN make outgoing calls on WiFi, but not get INCOMING calls on WiFi. Hubby thinks it is probably something wrong with the way it is routing WiFi calls, but I have tried everything and nothing works to fix it. I found this item that may help. Concerning no incoming calls when on WiFi. "I had the same problem. I discovered on my WiFi router under Advanced -> Firewall Settings -> APPLICATION LEVEL GATEWAY (ALG) CONFIGURATION that SIP was unchecked. Checking it and then clicking Save Settings fixed the problem for me!" Not sure completely how to do this, but I really don't think that could be the issue... I can make calls out on the wifi, and I borrowed my sister's freedompop phone and it receives calls just fine on the same wifi network. So if one phone works on the wifi network just fine, and I can call out on the trouble phone, it should not be the network, right? I thought I seen this as a helpful app. But in most cases not so helpful. Maybe to the user that never used a smartphone before. But if you just new to this service. Troubleshooting an Android device isnt hard. If you feel your calls and text not coming through from the messaging app. All you would have to do is test out other messaging apps. Another thing I would recommend users that on basic smartphones is that you may have to clean out caches and clear data from apps and services from time to time. I know that sounds like a lot but sometimes it helps your device and apps run smoothly.